You could think of the striking Norseman as a handsome lad who never made it to his prom. Here's the story. 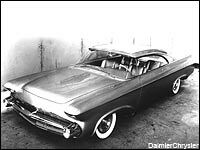 Chrysler chief designer Virgil Exner was working overtime in the early 1950s to help transform his company's dowdy product styling. Among the steps taken, Exner began a relationship with the Italian design house, Ghia. The relationship resulted in several concepts and a handful of low-volume production models. During 1955-56, one of Ghia's main projects was to bring the Norseman to life based on sketches and models created by Exner's studio. The body was to be fully functional and placed over a Hemi-powered Chrysler chassis. Working more than a year, the talented Italians handcrafted every element of the exterior and interior, struggling a great deal with the striking cantilevered roof. Nearly all of the roof's mass needed to be supported at the rear so that the leading edge did not to place any stress on the delicate wraparound windshield. Completing the roof structure was further complicated by the innovative power-retractable sunroof (think Porsche 911 Targa). On schedule, the completed Norseman was carefully loaded for transport to the US onto a modern and luxurious ocean liner. The Chrysler design team back in Highland Park, Mich., eagerly awaited the car's arrival. It was July, and the transatlantic trip would deliver the Norseman to the states in plenty of time for the 1957 auto show circuit. The Norseman never made it. In an accident chalked up to human error, the ocean liner collided with another passenger ship, the MV Stockholm, off the coast of Massachusetts. The Andrea Doria sank within hours, taking the Norseman and all of its other cargo to the sea floor. Few Americans ever saw Exner's clean, nearly chrome-free design at full size. Perhaps, if the Norseman had completed its crossing, the design would have positively impacted Chrysler's styling as the company dealt inelegantly with the transition from the "fin" to "no-fin" era.